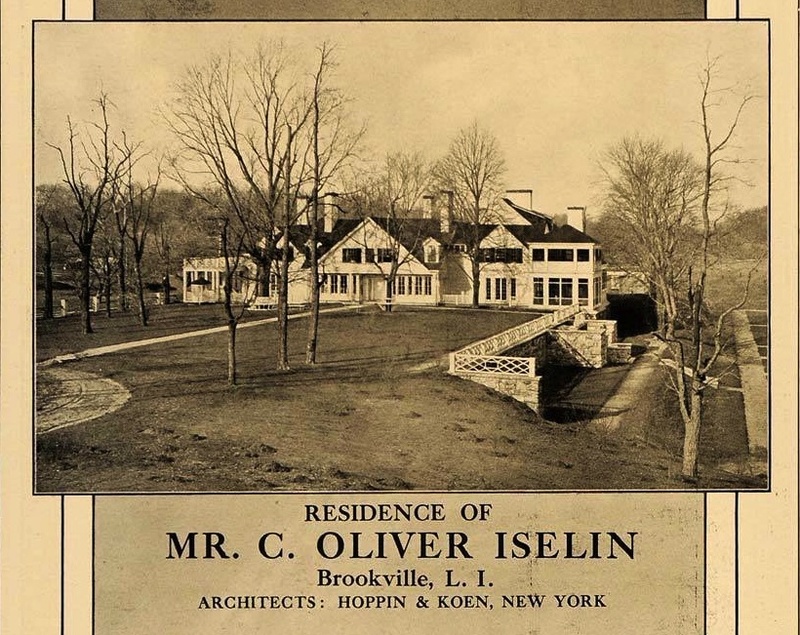 'Wolver Hollow', the Charles Oliver Iselin estate designed by Hoppin & Koen c. 1914 in Brookville. Iselin, a member of the America's Cup Hall of Fame, was an investment banker and yachtsman. His wife Hope Goddard Iselin was the first woman to sail in a America's Cup race. The residence was later substantially altered by Warren & Wetmore and subsequently by Harrie Lindeberg (c. 1941). The stone staircase visible on the right side of the photograph is extant and you can see that the orientation of the house was later rotated 90 degrees. Click HERE and HERE for more on 'Wolver Hollow'. Click HERE to see 'Wolver Hollow' on google earth and HERE on bing. The original home design looks very non-Hoppin & Koen if I can be so generalizing. It's actually very refreshing and progressive without being overwrought. 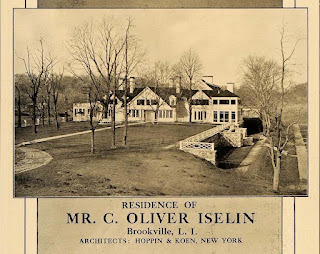 A Shingle style influence without being shingle style. That lovely "A" facade works well and the balustrade with the stone wall is quintessential rural charm. Was it considered not grand enough by the depression era? Or did the house transfer within the family and a new head of household wanted something different? Today it seems to be far from charming even with the uber skilled hand of H.T. Lindeberg. Kellsboro--it is a more relaxed H&K--from this side, but if one views the entrance front, more of the usual H&K motifs are in play. This home always confused me as to why the main house was built so close to both roads, while they has so much land the extending further in that would have given much needed privacy. ^ I have wondered that too but always keep in mind that at the time Wolver Hollow and Chicken Valley Roads were dirt roads with very little traffic.